Have you ever been bored at a business or academic conference? Maybe it's not your fault. Seth Godin writes that conference organizers too often shoot to satisfy the middle of the bell curve with the goal of being average and avoiding failure in an attempt to pull off a successful event. It's all so similar. All so typical. Even conference presentations aim for the average. Says Godin,"...we end up being flown on average planes to average hotels to sit in average conference rooms and hear average speakers doing presentations filled with bullet points." Since most conferences focus on the "typical," Godin suggests we become atypical if we're serious about making an impact. "Stories and irrational impulses are what change behavior. Not facts or bullet points." We need to connect, then, with people's emotions too. Conference speakers need to appeal to the rational side of their audience, of course. Humans are rational beings after all. But our evidence, proof and "facts" need to be placed in context and need to connect and appeal to the emotional too. Some argue that emotion is not necessarily irrational, that intelligence and emotion go hand in hand. And that may be. My point is that facts alone are rarely a sufficient condition for change or impact (though they are a necessary condition). A college professor told me that she attended a national conference in Japan on English teaching recently and that one presenter gave a PowerPoint presentation on the topic of multimedia in the classroom. Sounds exciting, right? The speaker's presentation, however, consisted of an endless stream of bullet points detailing (with text) what is possible today with multimedia. Ironic...but not unusual. Proof that we live in a sick "PowerPoint culture," many conferences today require speakers to follow uniform PowerPoint guidelines (to insure that they all look fairly similar) and submit their PowerPoint files far in advance of the conference. 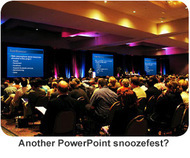 The conference now takes these "standardized PowerPoints" and prints them in a large conference binder or includes them in the conference DVD for attendees to take home. What the conference organizers are implying, then, is that an encryptic series of slides featuring bullet points and titles makes for both good visual support in your live presentation and for credible documentation of your presentation content long after your talk has ended. Thanks to Jon Gabriel for the inspirational title of this post. The absolute worst is when they can't get the powerpoint presentation to start, so the presenter just stands there not knowing what to do. I know exactly what you mean. I recently had to create a presentation summary guide for a technology conference, and my instructions were basically to layout all the presenters' PowerPoint slides in booklet form. Needless to say, all the slides were hideously ugly, being made in PowerPoint on gaudy Microsoft templates and jam-packed with bullet points. Most presentations fall in a sort of dead zone, not having enough information to be useful, and not having enough focus to be interesting.